I've been unwell for almost a week, prescribed with antibiotics and have been on plain and tasteless meals ... 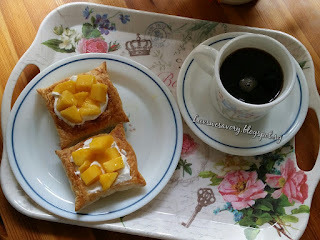 Somehow I had that sudden craving for some sweet pastries or tarts. With some sweet mangoes, some whipped cream and the pack of frozen puff pastry in the freezer, I still could charge up some energy to make some quick and easy fruit tarts to satisfy my craving. Line parchment paper on a large baking sheet. Place a sheet of frozen puff pastry. *Note: for easier handling, I didn't thaw the pastry sheet. Leave for about 1 - 2 minutes before cutting up the shapes. Cut into 9 squares using a pizza cutter or a sharp knife. Lightly score a boarder about 1cm crust from the edge of each square. Don’t cut all the way through. Lightly brush the border with egg. Place the tray of puff pastry in freezer for about 10 minutes. Remove the tray from freezer. Remove from the oven, immediately, gently flatten the centers of each of the squares with the back of a teaspoon. This indent is to make space for the toppings. 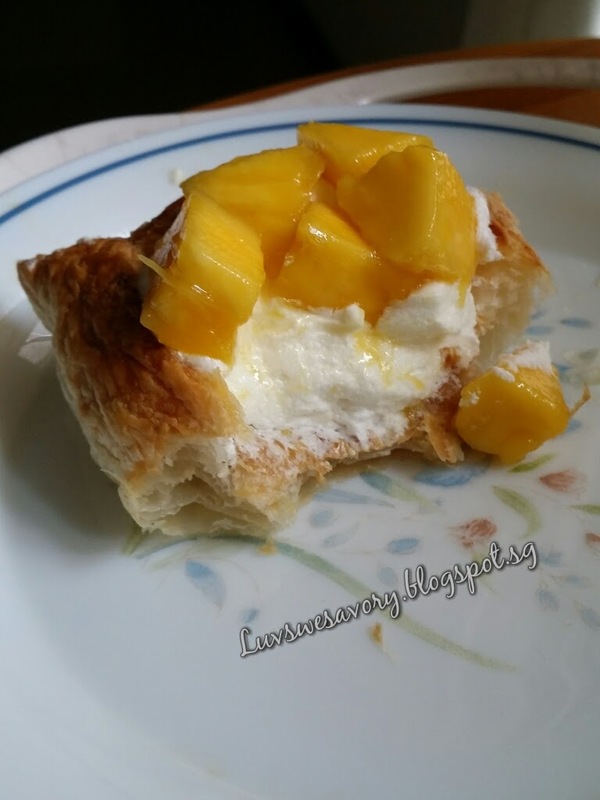 Once the puff pastry cooled, gently dollop about 2 tablespoons of whipped cream onto each of the square and top with diced mangoes. (Note: I've prepared the whipped cream in advance of baking and chilled it in the fridge till ready to use). Freeze the cleaned mixing bowl for about 10 minutes. Take it out from the freezer, immediately put all together the cold whipping cream, vanilla extract and caster sugar in the cold mixing bowl. Use the electric mixer to whisk till stiff peaks form. I couldn't wait to polish off the two sweet juicy mango tarts at one go for my afternoon break ^-^! 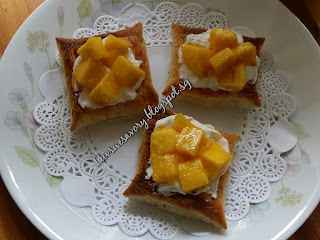 Hee ... hee .. the unpleasant medicines seemed to taste sweeter after I've filled my tummy with some sweet mango tarts ... Enjoy! Hi, Karen, wish you are well now. 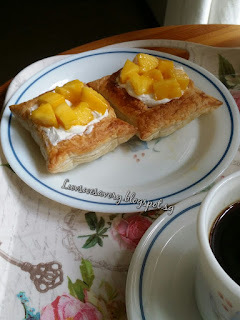 This mini mango fruit tart is easy and tasty! Thanks for linking up with LTU! Thanks Jozelyn, I'm much better now. Hope that you are feeling better now... I'm still trying to recover from the trips. Catching up all the blog visiting and blogging. Sweat sweat!!! I need to relax and eat some of your recovering mango fruit tarts too. Rest well and recover soon! Ha ha ! Zoe, thanks. I'm also "sweating" but almost recovered ^-^! Thank you Edith :) you have a great weekend! I hope you are fine by now. Very delicious looking mini mango tarts. 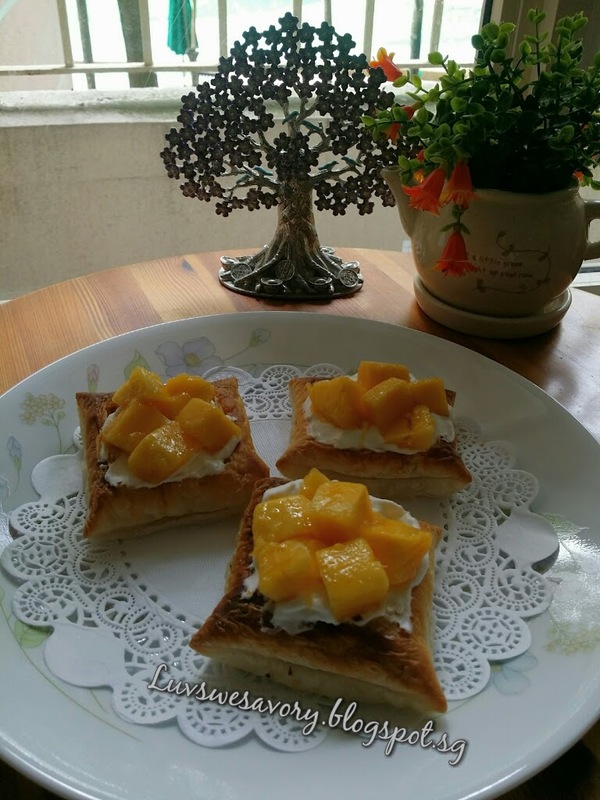 Hi Karen, your mini tarts look amazing, I love mango. Hope you feel better soon. Yes yes ! Thanks LY ^-^! Karen hah..hah...I bet you felt better after eating the mango tarts. Your story reminds me of the Disney song "Just a spoonful of sugar makes the medicine go down..."
Oh ! Mary Poppins sung Julie Andrews ... hee .. hee ... so true ^-^! nice pillows of mango puff dessert, shall try baking some with my frozen puff pastry.